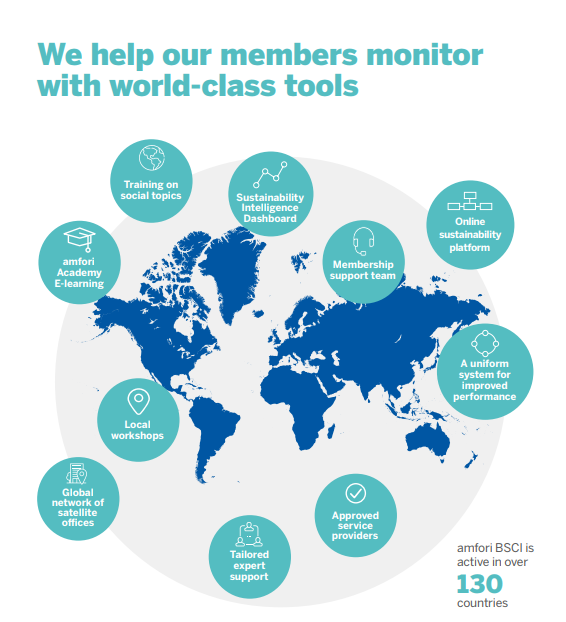 The new amfori BSCI brochure is now available, detailing the an overview of our tools and services in helping our members around the world to improve workers’ lives. In August 2017, we launched a Responsible Recruitment module to consolidate amfori BSCI’s response to this global issue. We developed practical training and guidelines that feature a step-by-step approach to identifying, preventing and remediating recruitment abuses. So far, we’ve held workshops for over 100 people and over 200 have benefitted from our amfori Academy training about forced labour. The British government introduced the UK Modern Slavery Act in 2015 to tackle slavery within any organisation conducting business in the UK. Last year, we responded to calls from amfori members to provide specific guidance and practical tips on the Act as well as indications on how to integrate the data available on the amfori BSCI Platform. The amfori BSCI Zero Tolerance Protocol aims to respond accurately and efficiently to flagrant human rights violations found during an amfori BSCI audit. This past year, 125 Zero Tolerance cases were initiated, allowing for immediate follow up and remediation. In 2018 the Zero Tolerance protocol has been updated to improve the effectiveness of assessment and remediation processes based on amfori’s accumulated experience. Improving our services for members, the small producer assessment (SPA) is designed to help get a better snapshot of the working conditions of small production facilities along the supply chain. It tackles some of members challenges by facilitating the social performance monitoring of smaller producers that are less formally organised and lack sophisticated management systems in comparison to large producers. Practice-oriented guidelines with a new structure divided into separate sections to enhance user-experience and target the specific information needs of participants, auditors or producers. Concise Annexes to dive deeper in priority issues such as gender, living wage, zero tolerance. Ready-made tools for participants and producers that conduct (self-)assessments and collect information.